Dr. Otto is a classic veterinary student. The dream of being a veterinarian started when I was five while growing up on a multiple species farm as I discovered the joys of animals. She attended the University of Missouri - Columbia and graduted in 2001. She was a member of the bovine, swine, equine, holistic and mule clubs. She also received the Buddy Award in Veterinary School. 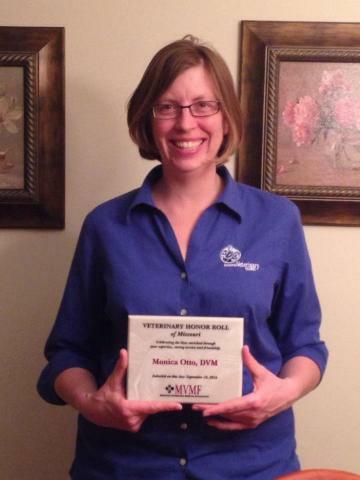 She joined the General Veterinary Clinic in 2001 following Veterinary School and has been there ever since. Kimberly Masters nominated her for this award. Dr. Otto's mentor is her partner, Dr. Jack Coleman. He has helped her not only iprove her clinical and surgical skills, but also improved her emotional status regarding the stresses of the veterinarian field. The veterinary profession is a very rewarding occupation. Dr. Otto is married to Lucas Lloyd who is a farmer and a mechanic. They have two children Alexis and Jacob. Leave a donation to help the foundation in honor of Monica Otto.